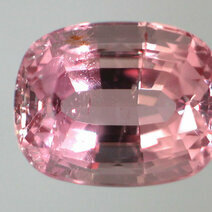 The pink variety of beryl. It thus has the same specific gravity as aquamarine. Morganite has a hardness of 7.5 - 8 and a specific gravity of 2.71 - 2.90. It was named for J. Pierpoint Morgan, the American industrialist and gem collector.